I am not lying to you. 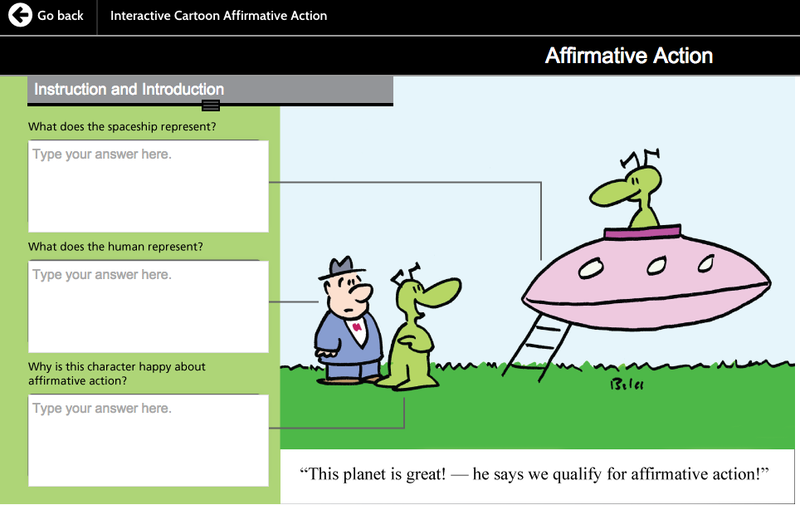 Yes, Texas textbook designers have found a new way to deride social progress by using aliens as their muse. But first, the peer reviewed academic material. In 2012, the post “Illusion of Inclusion,” Article about Race and Standards in Harvard Educational Review introduced a peer reviewed textual analysis of the Texas Social Studies Standards. And a U.S. history textbook mentions segregation only in a passing reference to the 1948 integration of the armed forces. So about those aliens and their social studies ideas. Maybe you had thought you had heard it all from Texas educational policy cowboys. But alas, no. 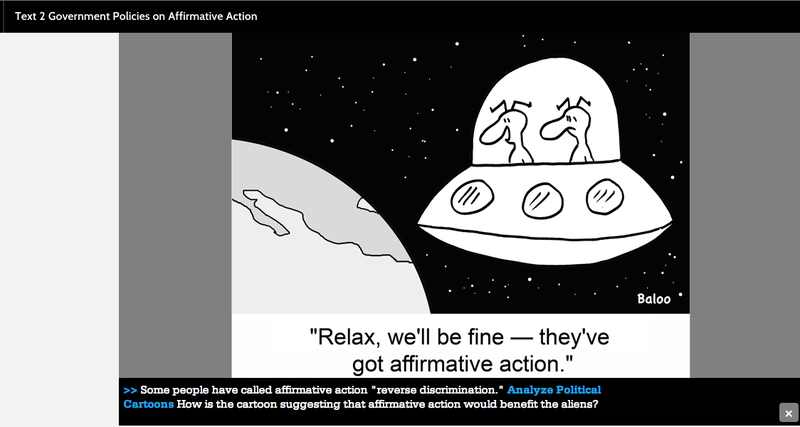 Texas is using aliens in cartoon to push a “conservative” (hostile) perspective on Affirmative Action in the social studies curriculum. The text also makes the ideological, unwarranted, and unsubstantiated prediction that “[i]t seems clear that the days of affirmative action programs are drawing to a close.” The evidence the text provides to support this claim is inadequate and lopsided. The text rests its claim in part on a Supreme Court case striking down an affirmative action policy (Ricci v. DeStefano) that was decided by a 5-4 margin. This means, of course, that the replacement of just a single Supreme Court justice could lead to very different outcomes in future cases regarding affirmative action. In addition, the federal government and state governments continue to maintain and even expand various types of affirmative action programs. To use just one recent example, in July 2014 Virginia Governor Terry McAuliffe signed an executive order designed to expand contracting opportunities to small, women-owned and minority-owned businesses. It is also at least plausible to predict that the increasing proportion of minorities in the nation at large and in individual states could lead to greater public pressure for the adoption or maintenance of affirmative action policies. On a related note, defenders of affirmative action would argue that recent bans on affirmative action provide reason for voters to affirm the continued relevance of these programs. The University of Michigan claims, for instance, that minority enrollment dropped 33 percent from 2006 to 2012 after Michigan voters adopted the Michigan Civil Rights Initiative (also known as Proposal 2) in 2006. In light of the text’s neglect to mention any evidence possibly contradicting its prediction, it is difficult not to suspect that this prediction, which has little pedagogical or descriptive value for students, is intended to persuade students about the illegitimacy of affirmative action. This suspicion receives further confirmation from the inclusion of a clickable box that identifies states that have banned affirmative action. The caption accompanying this chart reads: “Affirmative action has been attacked most often in education…Why might states believe that banning affirmative action is beneficial to them from an economic standpoint?” The text does not include a similar chart identifying the states that have maintained affirmative action policies or one encouraging students to consider the possible economic and non-economic benefits of maintaining or expanding affirmative action. In addition, the sole textbook review question on affirmative action in this section further encourages students to question or oppose affirmative action. The multiple-choice question asks: “The Supreme Court applies strict scrutiny to affirmative action quotas because . . .” The correct answer is that “quotas make it impossible to choose individuals on a case-by-case basis.” The text provides no question suggesting why affirmative action programs might be consistent with the Constitution. Before the board decides on whether to approve the books for teaching to Texas’s 5.1 million, majority-Hispanic public-school students, a 140-member review panel, appointed by the board, will submit reports on whether the books are accurate and conform to the standards. But it may not be a panel that inspires much trust. The board will hold public hearings before deciding whether to approve the books. A few years ago, I taught a group of Alternative Education students sent to my classroom because of violations of CA Education Code: They had been EXPELLED from the regular comprehensive high school for one year- but, under CA Education Code, were entitled to an Alternative Education opportunity. One group of the White students were progeny of explicitly “racist” KKK, Arian Nation, Christian Identity affiliated parents and had, had extensive experience with their parents in attendance of “racist” related meetings and rituals. Another group of students were Native American and they were active with their tribal activities, learning about their history, culture and rituals that supported them. They were all 11th grade U.S. History students. One of the field trips we took was to a CA state park in the foothills of the San Joaquin Valley. At a museum in the park was included a diorama about the “history” of the region with elaborate “White Pioneer” family representations of the regional development. Also, included was a diorama “representation’ of “The Indian” … with no other explanation than the “objects” of representation. The native students became upset immediately and stormed out of the Museum while the White students were at first simply confused. There isn’t time or space here to talk about all of the discussions, research and writing that occurred. One of the most positive outcomes was that the Native Students wrote to the Director(s) of the state park with a complaint and received a letter and an acknowledgement of egregious error- and that the exhibit would be changed. From an educational leadership perspective the most negative outcome was the deafening silence from the local school board and top administration regarding the correct action those alternative students exhibited, much less an acknowledgement of the ‘racial problems” … that existed. Watch video: Filmed in 2008 during time I was Cabinet Level Administrator – Indian Education Film created by students: http://www.youtube.com/watch?v=JggvenDPcuc : The Project – created as part of “community service grant” … vimeo.com/19806183 : I walk my path: The Helen Coats story. Hello peachymeyer: I agree with you totally, from a policy perspective. I’ve often referred to the CCSS as part of the “educational industrial complex” or “e-educational e-industrial complex” and you have no argument from me on the policy and economic, political impact of CC$$ as you refer to them. I’m also a teacher, in a public school classroom. The horns of this dilemma is that I have relief from the Neo-Conservative agenda to culturally imbue ALL students with Right Wing ideological tripe, through scripted lessons. Now I’m being delivered into the hands of Neo-liberals who don’t care about “culture” or “history” … just efficient STEM workers. Hey, Monty, I agree, and I’m happy to hear that the scripts are abating for you. I too was a public classroom teacher until recently, and from what I hear from my former colleagues, they (the scripts) are still going strong, even more so, with more restriction and control, maybe with a different face. So I don’t really see improvement. “Reform” plays out differently in different places, and even though many aspects of the neo-con and the neo-liberal agendas are definitely different, neither one is any good for free public education. Well taken re critical race theory and related history. But as for teachers’ relief, just wait until you see the tests that are the engine behind CC$$, because they are the principal money makers. Not much difference there. And even the supposed write-your-own-answer items are scored by machines and people hired off of Craig’s List and supplied with “rubrics.”. So not really very different; AND they are expanding well beyond NCLB testing volume. The pushers of CC$$ hype their supposed “critical thinking” aspect, but the examples so far belie that claim. True criticism of the powers that be is anathema to those same powers that are behind the “standards” and the tests. 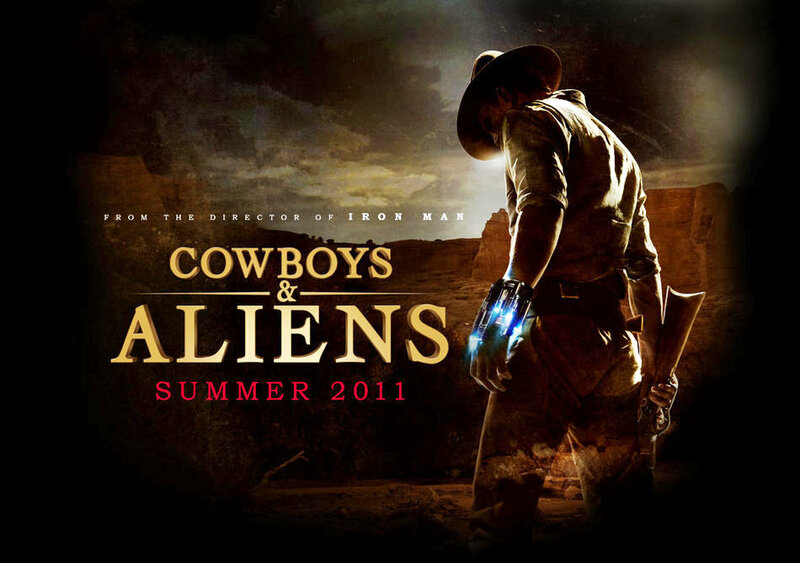 Robber Baron’s and Aliens: – I completely agree with the Critical Race Theory Analysis. In the late 19th Century America, who did the work? Who were the heroes and took the credit for the American industrial growth? It was the Robber Baron’s who took the credit. They were also philanthropists, much like today with Bill Gates and others. In that day, Leland Stanford in CA and Cornelius Vanderbilt in the East were two of the earliest. But, who were their workers? They were of course, nameless, black former slaves, and Mexican, (indigenous and immigrant) workers, and Chinese, Irish and Italian immigrants, all, (aliens) who built the railroads, developed the mines, built the factories, and, settled the farms in the west. Many years ago I was the academic coordinator for a university Upward Bound program at UNO in New Orleans; pre-Katrina. NCLB had been, at the time in the 1990s transported from Texas into Louisiana and both promotion and graduation depended heavily on NCLB or LEAP tests. All of our Upward Bound students, mostly African Americans, met the criteria to be in the program: 1. First generation (parents had not attended college), 2. Met low income criteria, 3. Had good potential to succeed academically in college through examinations of testing and GPA criteria. Sounds like a great program, right? It was one of the few Johnson “Great Society” programs that withstood the assault by conservatives to destroy (government) “affirmative action” type programs from the era beginning with the1964 Civil Rights Act. Today, in CA where I now teach, I heard that African American students have truancy rates four times greater than Whites. Why? While many factors contribute to this, I can’t help but think that “relevancy” in curriculum and the (not so subtle bias in curriculum that leaves out meaningful curriculum for African Americans) in particular, must contribute. I remember struggling in tutorial sessions with Upward Bound students to explain the different “Robber Baron” “Captains of Industry” that they had to learn to identify to be successful on LEAP/NCLB tests. I remember how non-relevant the information seemed to those students at the time. We struggled through it, however, and learned it; i.e., to correctly mark a, b, c, or d. No critical analysis, no choices but one. In that regard, CCSS, from a teachers perspective offers some relief. Holy crap! It just gets weirder and weirder. Those cartoons are unbelievably stupid. I’m wondering if there’s some sort of brain parasite affecting these people. I’ve noticed that they not only lie about such matters as affirmative action, they actually scam each other with get-rich-quick schemes and bogus cures. I wonder if any of them ever discover how they’re being used by their corporate rulers.